Climbed May 9th, 2002 and December 2nd, 2012. 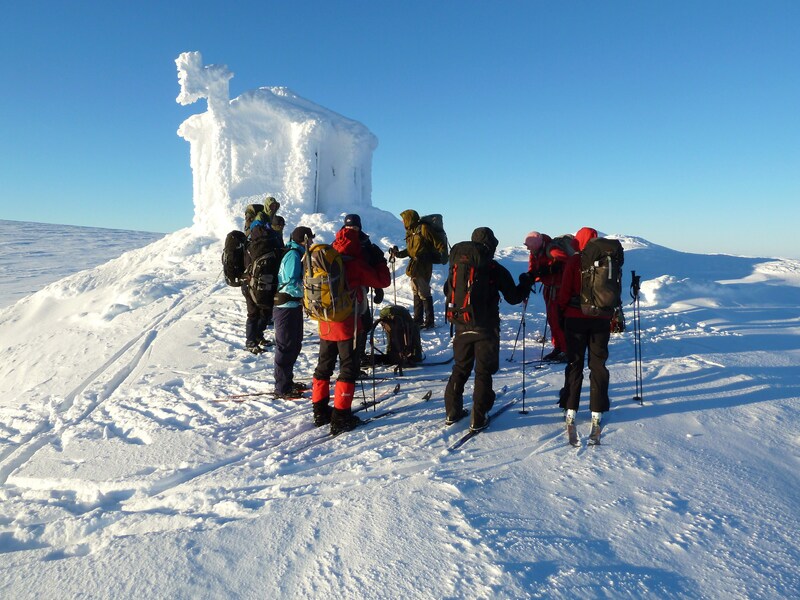 How to get there: The natural starting point is the railway station Finse, the highest point on the railroad connecting Bergen and Oslo at 1222m. The train from Bergen takes 2 hours 15 minutes, from Oslo the time is substantially longer. Route description: A good time to do this is in May, there is a marked ski trail from around March (Easter time) and until June. 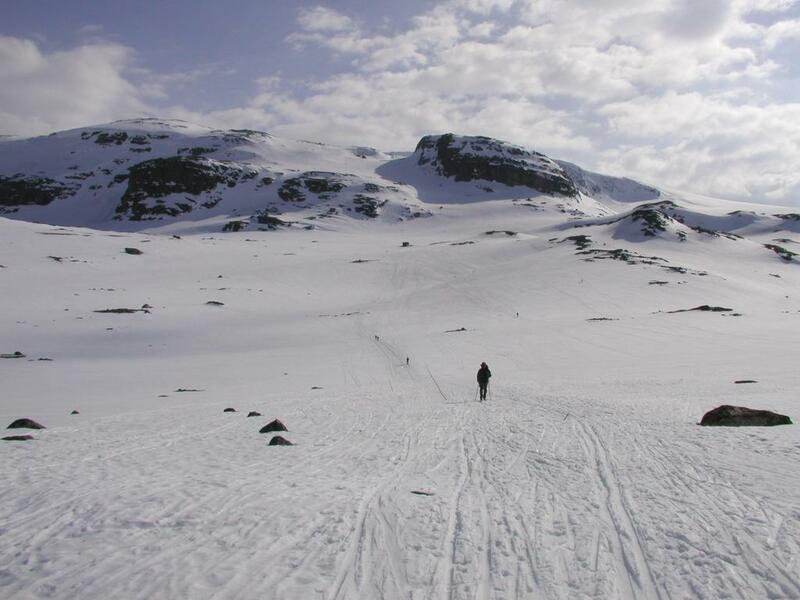 The route heads south from Finse, towards N. Kongsnuten, where a small hut, Appelsinhytten, is located. Then more west, following the east side of the Middalen glacier, turning east behind the N. Kongsnuten, then climbing more steeply to the last rocks at this side at 1765 m where there is a small hut (named Jøkulhytta) operated by the Red Cross. From here gently uphill to the highest point, or rather glacier plateau. 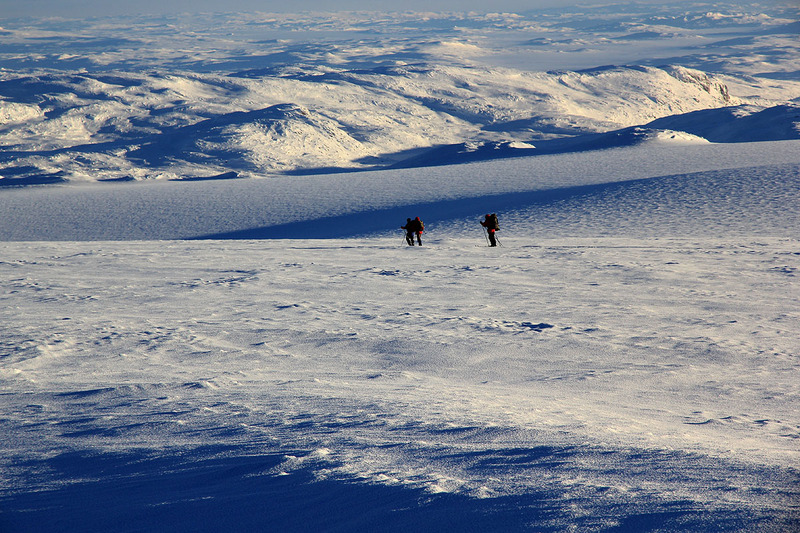 In the season, the trail continues west across the glacier to Dyrehaugane and back to Finse. Route to Demmevasshytta: This self serve DNT hut is located close to Hardangerjøklen on the west side. 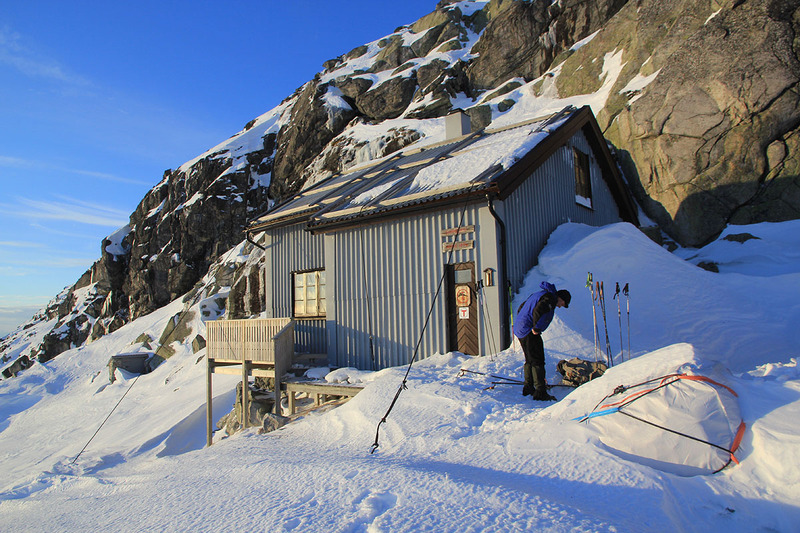 The Bergen Mountaineering Club has an anual pre-Christmas skitrip to this hut in the first weekend of December. 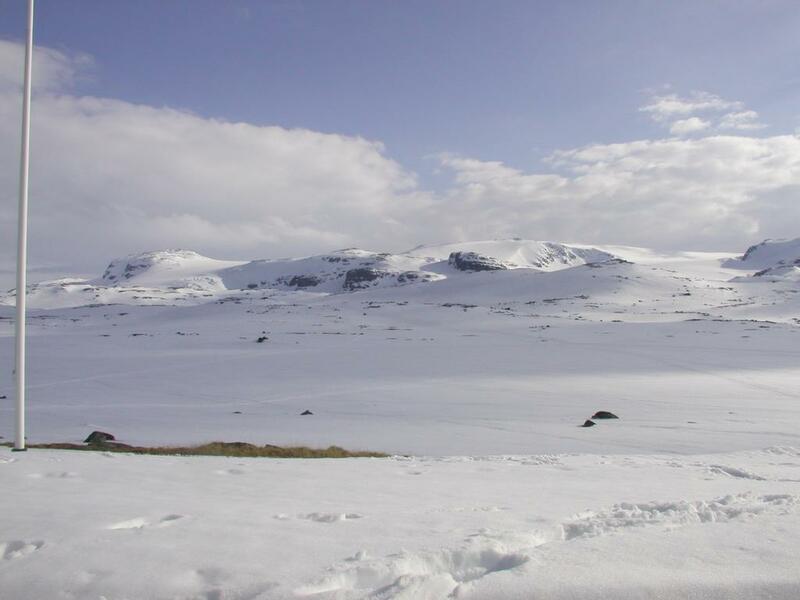 There are 3 basic routes from Finse (railway station) to Demmevass. 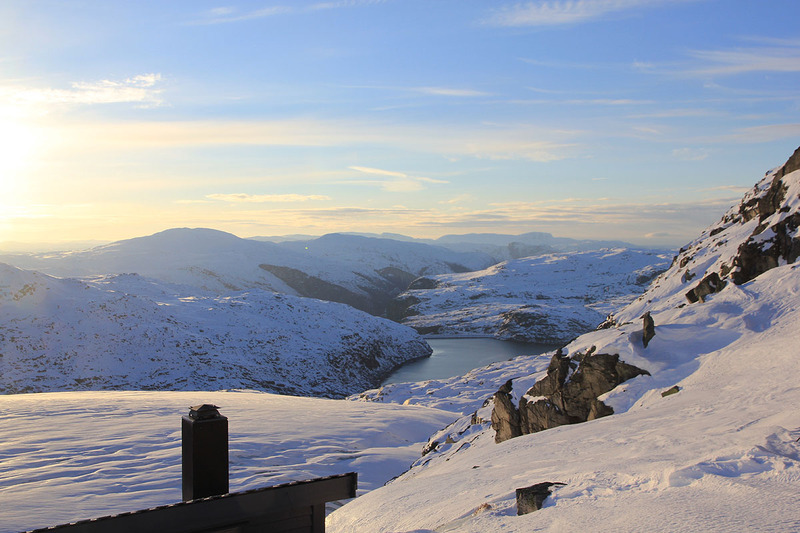 The first option is to ski to the west end of lake Finsevatnet, then follow the trail (marked with cairns) up to point 1487 (just north of), alternatively follow a line slightly further south and cross just south of point 1487. From here, the first variant runs around on the north side of Ramnabergnuten (1731m). Continue more or less along the cairned route, follow lake 1371 to lake 1362, climb a short, but steeper hill (stay north) at the east end of lake 1362. Then continue gently downhill to the upper Demmevass lake at 1293. Here, this route merge with alternative 2. The second alternative continues directly from point 1487 to the broad saddle east of Ramnabergnuten. This line crosses a part of the glacier. Care is needed to stay away from some steep snow/ice near a small lake (stay well to your left, ie. south). 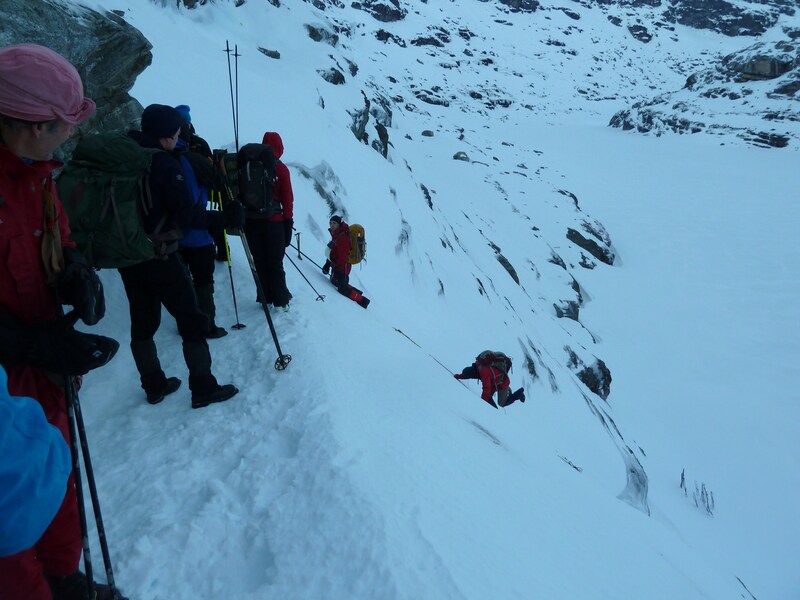 In order to descend to lake 1293, the route zig-zags down between steepish cliffs. The top of this route is well marked by several cairns. From lake 1293, proceed to lake 1290 near the connecting creek, then cross right to the west side of lake 1290. The next descent should traverse down left under a (frozen) waterfall. Once down, stay right to avoid dangerous ice blocks and possible holes. Finally, cross the lake 1240 to its south-west end. From here, one may either cross onto the crevassed glacier or climb the steep hillside just before a cliff, in order to get to the Demmevass hut. Either way, care is needed and the added security of a rope may be a good idea. 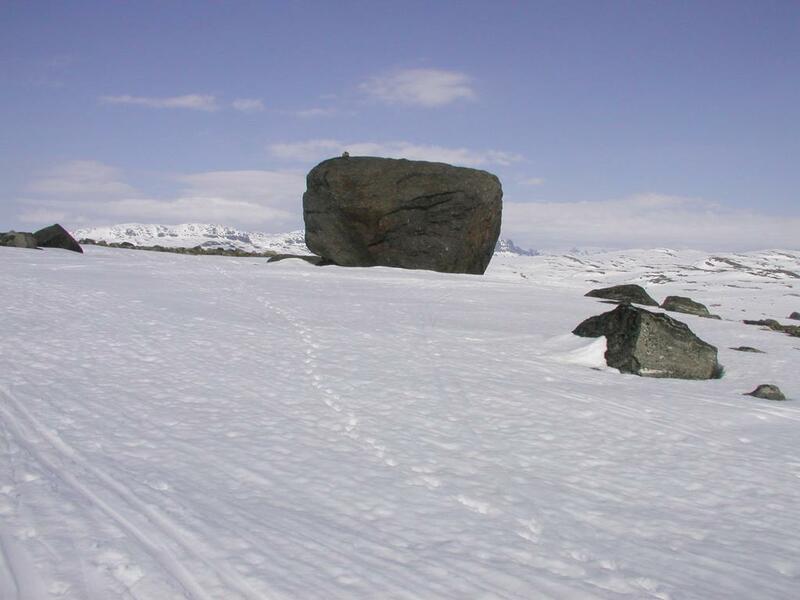 The third route, only to be recommended in good weather, runs across the top of the Hardangerjøkulen glacier. Ski directly across lake Finsevatn, then follow the route described earier via Appelsinhytta and up to Jøkulhytta (HM) at 1780 meter. From here, a short and gentkle climb to the summit. Head west from the summit, passing north of Olavsvarden (1763m). The key is to find the top (HM) of the "09 gully" (09-skardet), at location N60.54525, E007.32942, elevation about 1420 meter. This gully runs west between points 1567 and 1606, providing a nice route down to the middle Demmevatn lake (1290m). When the gully ends, you turn right and ski north-west down a broad slope to the lake. From here, as described above. Comments: I did this climb with my friend Arnt Flatmo. 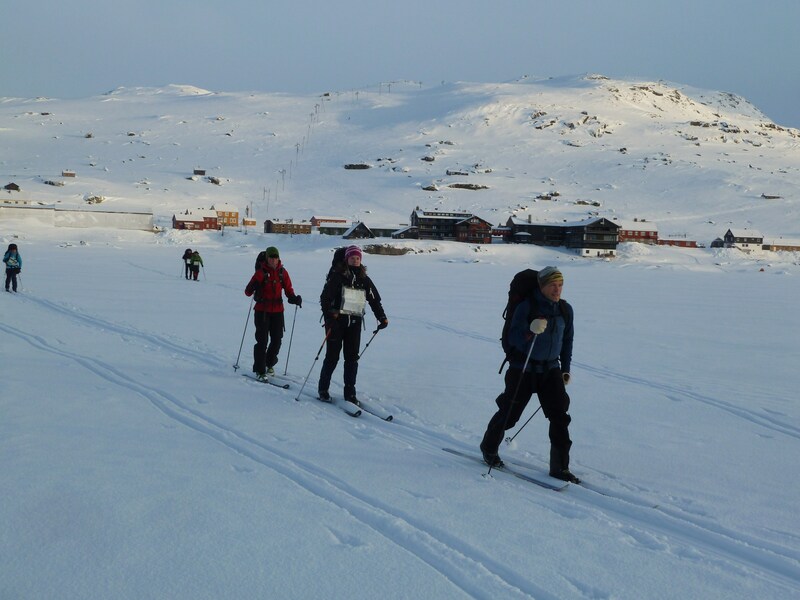 We started at Finse around 1035, reached the small hut "Appelsinhytten" in about 30 minutes, and the summit plateau after about 1:45. My 1:200.000 scale map lists 1876 m as the elevation, while the current NGO 1:50.000 map says 1863 m. The definition of elevation of a glacier could consider the level of ice, or some average snow cover. Obviously, this elevation changes with the season, with a considerable accumulation of snow each winter. My GPS indicated at least 1875 m, its reading on the nearby Ramnabernuten (1729 m) being only one meter wrong. It is therefore likely that we actually were 1875 m above sea level on the day of the climb. 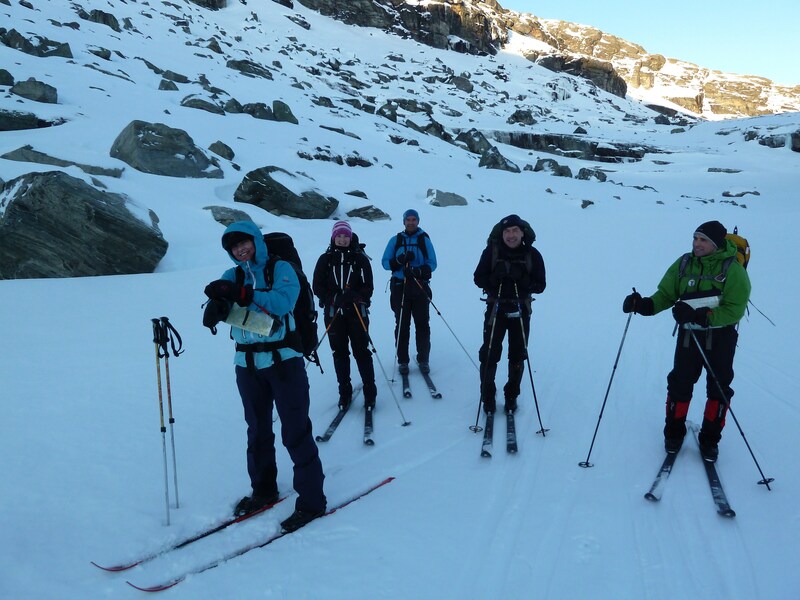 We actually climbed the summit twice, first in fog from Finse, later in the day in sunshine and very good conditions on our return ski from Ramnabergnuten. 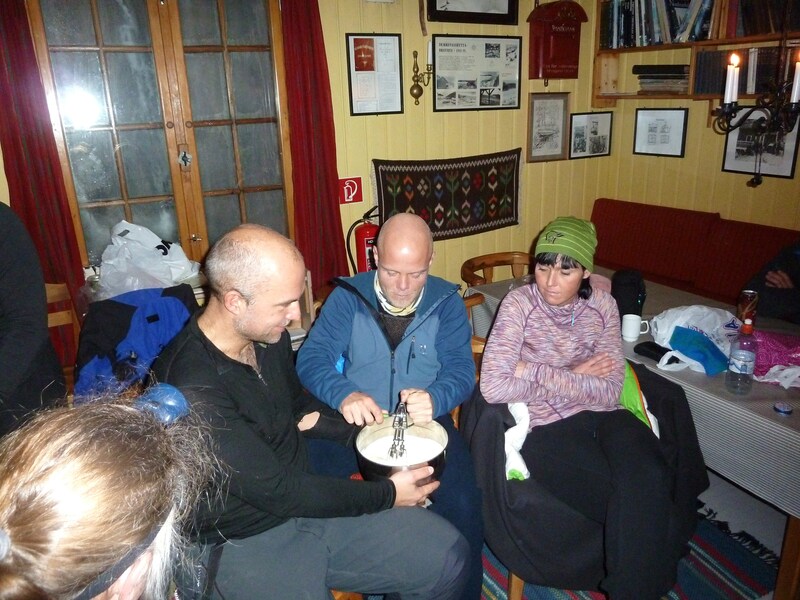 December 2012: This was the very traditional trip to Demmevass in the first weekend of December, to celebrate winter with a traditional Christmas dinner. We travelled to Finse with the 0758 train, arriving at 1017. It took a bit of time to get organized, thus leaving on skis (HM) around 1040. We were 13, 2 trip leaders (me and Stig Anton) and 11 participants. The weather was cold, perhaps minus 15 Centigrades. As we skied towards Ramnabergnuten a breeze added to the chill. Still, everything went very well (HM) and we were at the last Demmevatn lake around 1330. The climb up the steep side was just as steepish as before, but the scenery quite nice (HM), as we arrived at the hut already around 1350. I remember previous trips where this last section was completed in beginning darkness with the help of our head torches. Before long, the hut was slowly warming up and the "old boys" in full swing with the preparing of our evening meal. New participants helped with easier tasks. (HM) A nice evening, lasting longer than normal due to our early arrival. We decided to ski across the top of the glacier the next day, provided that the wind would be calm. Departure was set at 1000, no need to hurry with such a good forecast. The next day was just as nice as promised. 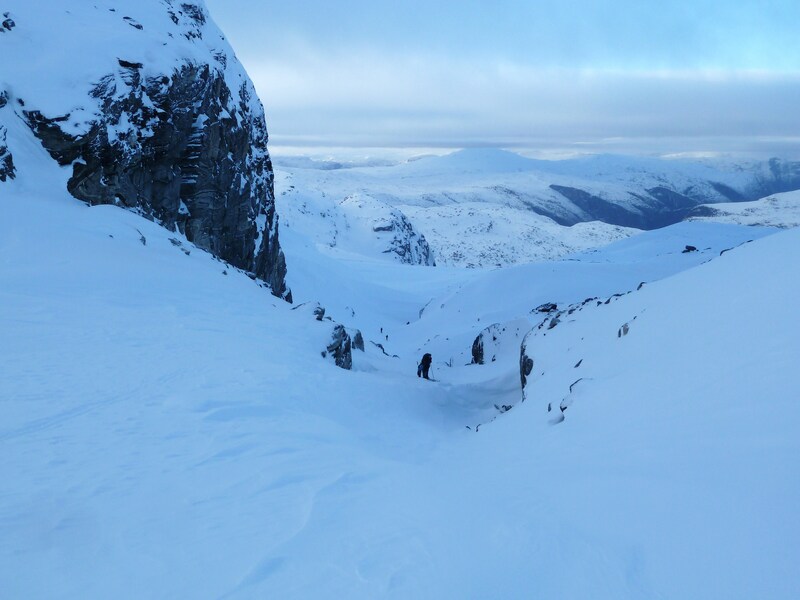 We left the hut roughly at 1000, put in some extra safety by using a rope to secure the steep descent (HM) back down to the skis. 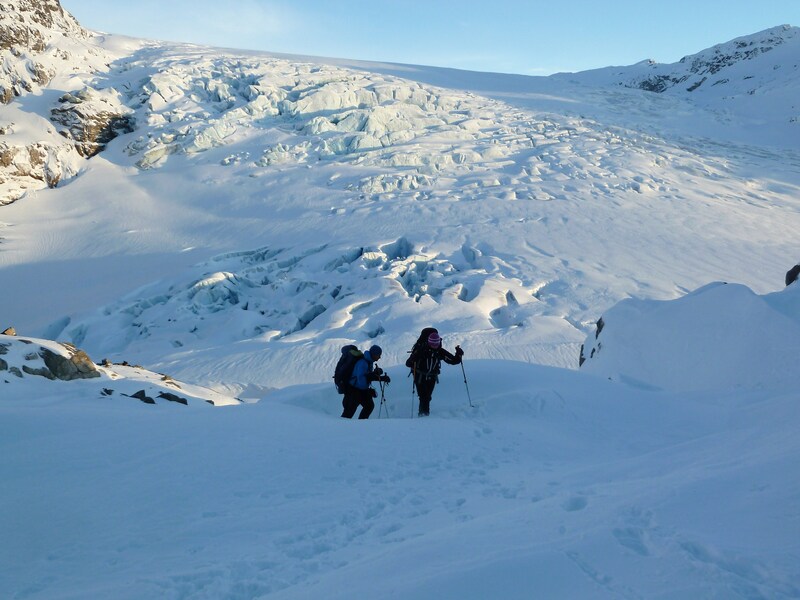 We skied up to the second lake, then the "09 gully" route (HM) to access the main glacier. The clouds drifted away and we had a very nice view all around. 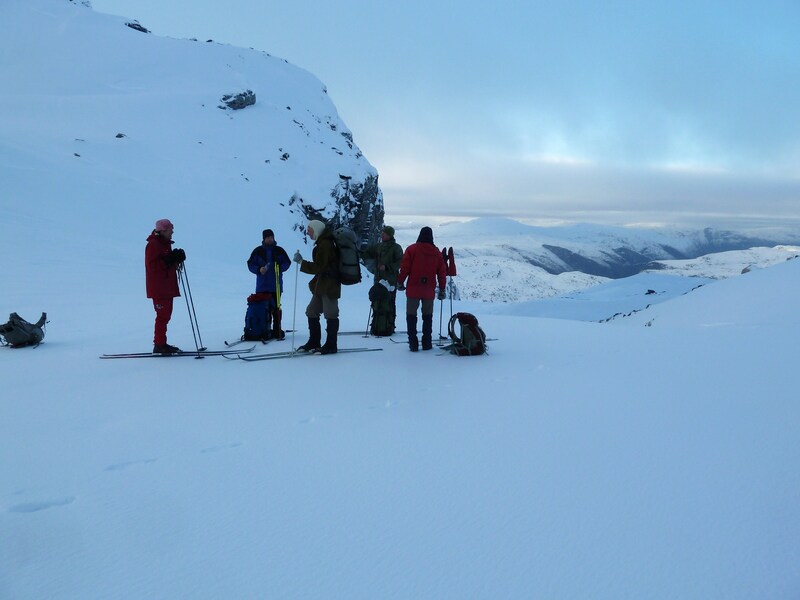 I reached the highest point around 1330 and soon we all skied back down towards Finse and into the cold slope already in deep shaddow. Cold, very cold. The temperature was below minus 20 degrees and skiing down a 600 meter vertical drop did add a lot of chill to our faces. I touched my nose halfway down, it felt pretty stiff. Arriving back at Finse around 1445, it was clear that we could take the 1526 train rather than the planned 1717 train, back to Bergen. Some photos (marked HM) in this report are copyright Harald Mjanger. 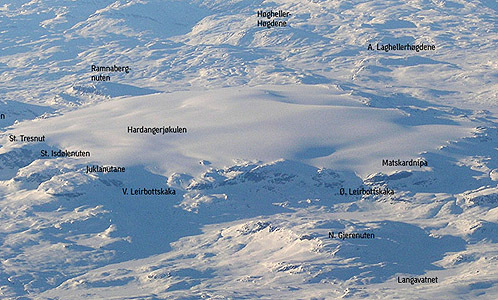 Hardangerjøkulen, and nearby mountains seen from the air. 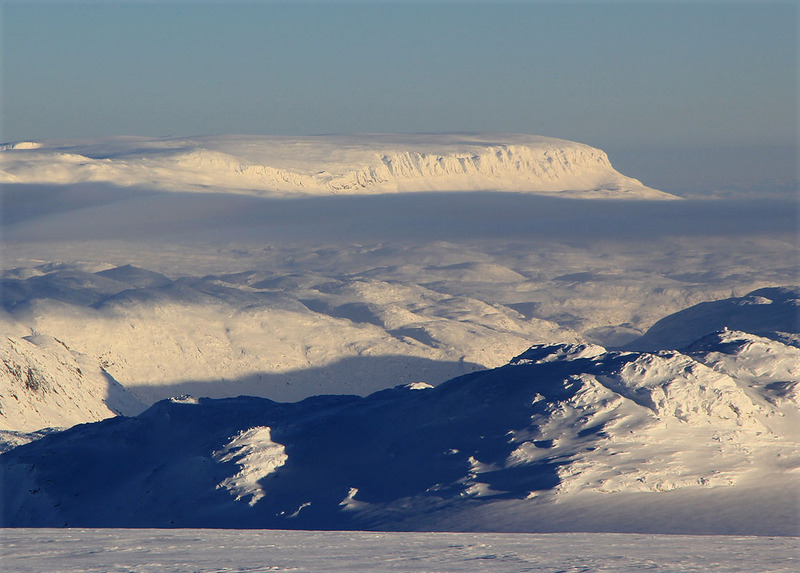 Hardangerjøkulen, as seen from Finse. On the trail to Appelsinhytten, one will pass this large boulder. View of Hallingskarvet behind. Appelsinhytten, can be seen in the distance, N. Kongsnuten is the prominent rock slightly right of center. The trail runs below this rock, then around on the right and continues up behind it. Hallingskarvet, as seen from Hardangerjøkulen. 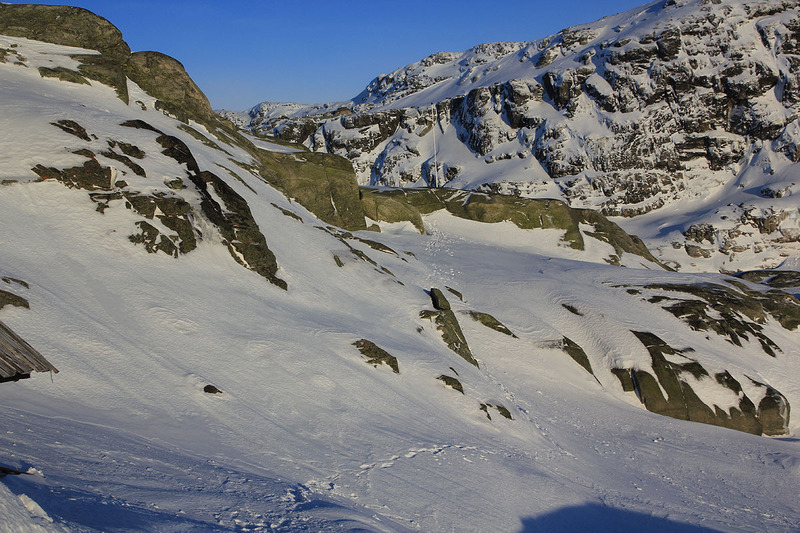 The highest point, Folarskardsnuten, is just left of the main pass that breaks the long, steep south face. 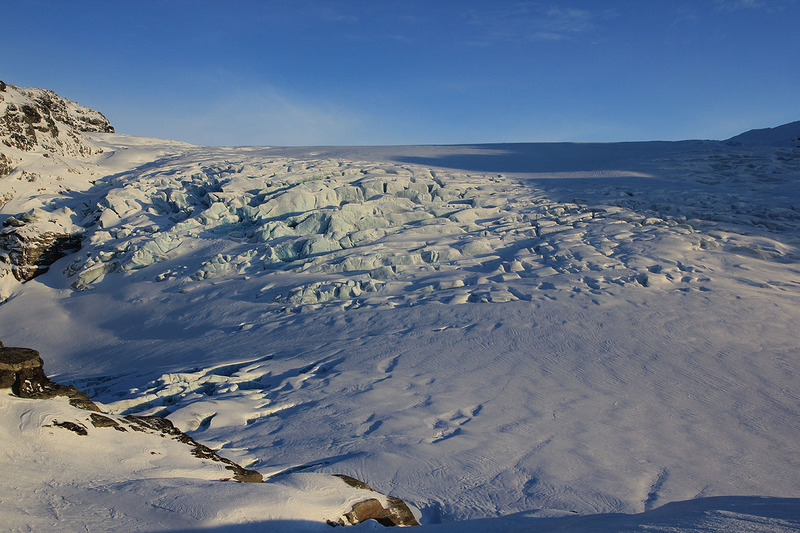 The glacier, as seen from the hut, late in the day. Rembesdalsvatn, as seen from the hut. 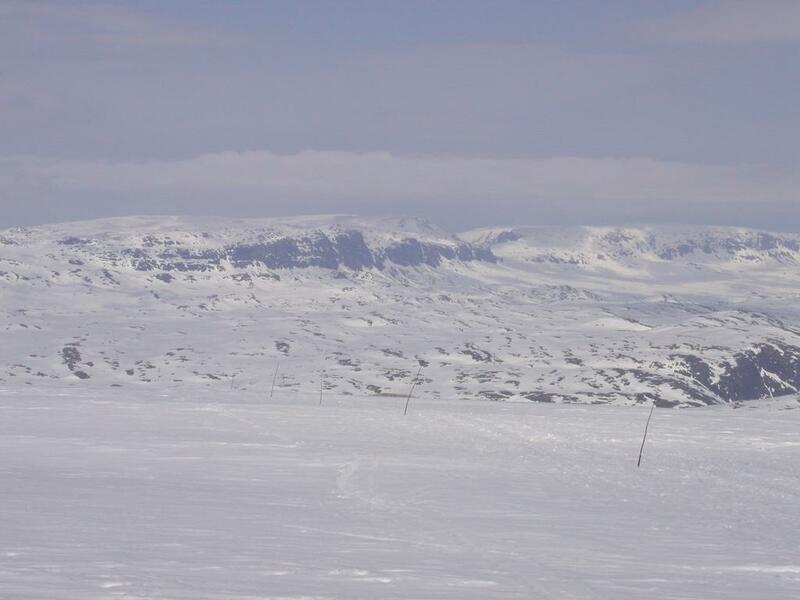 Finse, as seen from the summit. Hallingskarvet, as seen from the summit.